I was attracted to this book by its title (I like cats), but I'd never heard of Seymour before. A quick flick through the book showed that it was not of a nature with Eliot's [b:Old Possum's Book of Practical Cats|402128|Old Possum's Book of Practical Cats|T.S. Eliot|http://d.gr-assets.com/books/1327882662s/402128.jpg|372536], that is, a book of humorous verse all about cats, but it looked interesting and, at only a couple of pounds second-hand, worth a trial.The opening poem, Flute Girl is about a figure on an Athenian cup of about 480 BCE, a subject reminiscent of Keat's Ode to a Grecian Urn (though, other than the subject matter, is not like that earlier poem), and it becomes clear through the other poems that Seymour is a Keats aficionado, with several poems directly mentioning him, or indirectly alluding to him and his themes. 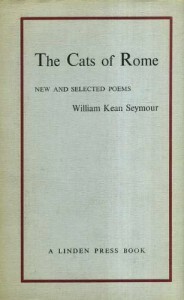 That's fine as I like Keats, too, and what's better is that Seymour doesn't attempt pastiche - he has his own voice.The Cats of Rome is framed as a conversational reminiscence of a stay in Rome and a meditation (I think) about isolation and the neglected poor in a city of plenty.Of the other poems, there were few that didn't strike a chord, but those I particularly liked were In a Cool Solitude of Trees, The Snail, Cestius and Keats, Purbeck Scene, Frost, The Estuary, Carnations, Fruitage, Ghost in Garden, Weeding and Kindness.There's nature poetry and reflections upon love, life and death. This was Seymour's last book, published in his 83rd year, five years prior to his death in 1975, so there is a feeling of youth gone, but not lost to memory, and of endings, and also of love and compassion.This was a lucky find, one of those books that justifies the hours spent rummaging amongst dusty stacks seeking for some forgotten or unknown literary jewel.